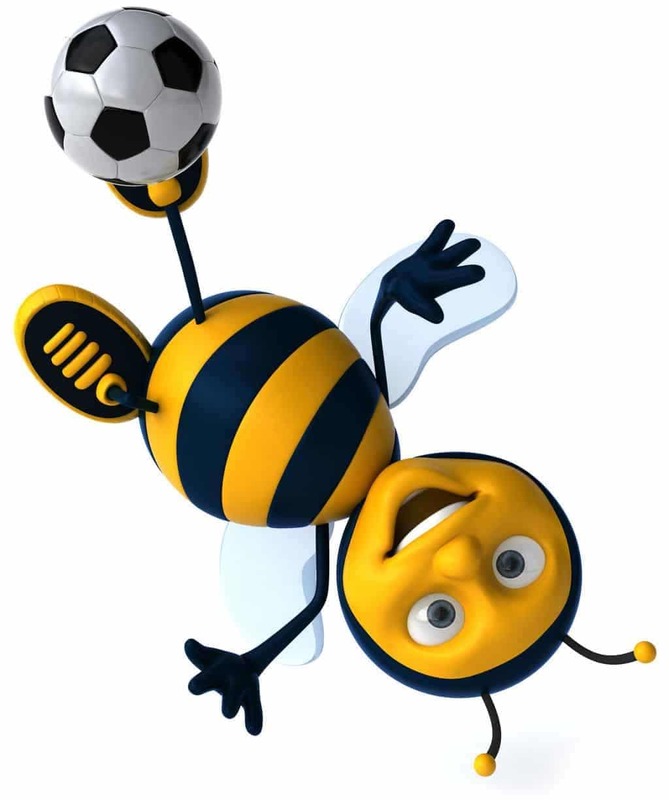 Bumble Bee Games for children in preschool through second grade. There are a couple versions of this game you can make. It may seem like a lot of work, but it is inexpensive, durable and you’ll have them when you want them again! ( These could also be made of paper with clip art and Velcro, but I like the durability of wood. ) If you don’t mind the work you can even make a hive out of painted juice lids or another metal surface for the bees to return to when the game is over. 1. Paint the front of the bees yellow. ( These can be spray painted with a non-toxic spray paint to save time. ) Paint an uppercase letter ( for an alphabet matching game ) or a numeral ( for a number matching game ) on the bee’s front. Paint wings, face, stripes, etc. to complete the bee. 2. Paint the back of each bee a different color or with different patterns so no two backs are the same. Spray the bees with a few thin coats of acrylic spray, front, and back. Add magnets to the back. 3. Paint each juice can lid to match one of the bees’ backs. If you are making an alphabet matching game, write the lowercase letter which corresponds to the uppercase letter on the bee of the same color or pattern in the center of the juice can lid. If you are making a number matching game, you can either write out the number word or make dots corresponding to the number for children to count. Spray the lids with a few thin coats of acrylic spray. 4. Add petals, stems and leaves to the flowers with felt, laminated paper or other materials. Hang on the wall or mount on a board. 5. Have children match bees by letters or numbers and self-correct by looking at the colors after they match them. If a child matches by the colors instead, I try to encourage him/her not to but don’t worry if s/he still does. Talk about hexagons! Bee’s make this shape in their honeycomb. Have the children find other areas in the room that have hexagons. E.g.. table, blocks, fish tank, tracers etc. Use bubble wrap to make honeycomb. Cover wrap with paint then print on paper. A good way to let the children burn off a little energy and discuss bees is to do a bumble bee dance. Bees dance to communicate. Have the children dance to communicate…whatever they want…feelings (happy, sad, excited) or directions to the table for a snack…whatever suits the mood and the group of children. Acting out bees: 2-4 large flower pictures with yellow paint in the middle on one side of the room (on shelves or tables) and a large sheet of paper with hexagons like in a beehive on the other side of the room. To help children understand what bees do, talk about how they have a long tongue that takes pollen from flowers and how the bees bring it back to their beehive and make honey. Give each child a q-tip and tell them it is their tongue. Have them fly to the flowers, use their long tongue (their arm with the q-tip) to get some pollen (the yellow paint), and bring it to their beehive to rub it onto the paper and make their honey. The children will enjoy acting like bees! Bumble Bee Games for preschool through second grade.